When I posted recently about my second-great-grandfather Cornelius Godshalk Sellers, I mentioned that I had found his father's name, Franklin Sellers, several times on a blog about Warren County, New Jersey, in the Civil War. Most of the posts about Franklin were related to the newspaper he published, the Belvidere Intelligencer. He was very pro-Union and invited Belvidere soldiers to write to him at about their experiences, and he would publish their letters in the newspaper. He seems to have held true to his word, because I found several examples on the site. He apparently was having a feud with John Simerson, the publisher of the Warren Journal, so his solicitation of letters from soldiers may not have been entirely patriotic, as publishing the letters was sure to help circulation. Also mentioned in three of the transcribed newspaper articles was Franklin's stepson, William (or maybe John) Mathews. I already was pretty sure my third-great-grandmother had been married previously, because the record of her marriage to Franklin Sellers called her "Mrs. Rachel Mathews", but this was the first time I had found information that she had children from the earlier marriage. I'm currently on the hunt for documents about William, but in a timely coincidence, soon after I read that he was present when Colonel Elmer Ellsworth was shot and killed while taking down a Confederate flag in Washington, D.C., Antiques Roadshow aired a segment in the first episode of the new season with someone who brought in a piece of that very flag. I got goosebumps watching it! Through the Chronicling America newspaper directory, I have found the names of more newspapers for which Franklin was the publisher. The Public's Advocate and Literary & Humorous Journal (now how's that for a name?) was published in Doylestown, Pennsylvania, beginning in 1838. Olive Branch, under several name variations, was also published in Doylestown, from 1842 to about 1853; Franklin was the editor in 1851. From sometime between 1850–1853 to 1857, Olive Branch came from Norristown, Pennsylvania. 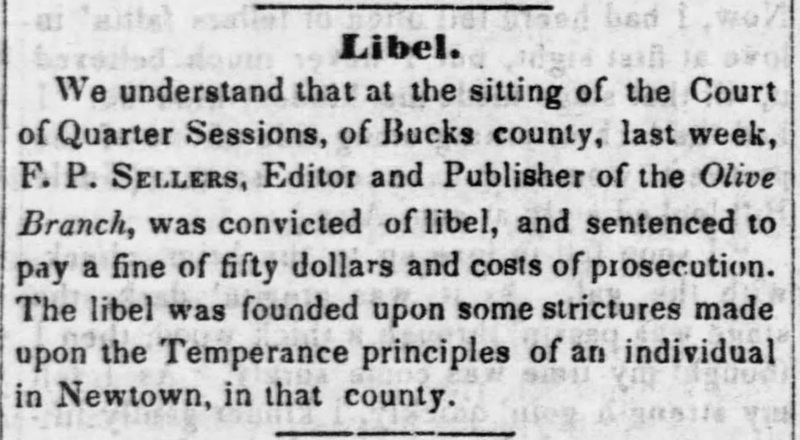 Concurrent with that, The People's Beacon and Independent Weekly Record appeared in Lambertville, New Jersey, from 1853–1858. And then there was the Belvidere Intelligencer, which Franklin ran from 1861 until his death in 1863. (What was he doing between 1858 and 1861?) I know newspapers from that period are hard to come by, but boy I would love to have a copy of at least one newspaper which he published. Franklin's name shows up a few times in histories of Doylestown and Bucks County. The stories say that he started Olive Branch, which was a temperance newspaper, because he himself had previously had troubles with alcohol. (I'm sure many people will find it amusing that I have an ancestor who was involved in the temperance movement.) But one history of Doylestown said it was a "very spicy paper", so I guess he wasn't stodgy! If all of that weren't enough to demonstrate that Franklin was a newspaperman through and through, every document I received from the New Jersey State Archives relating to him was a receipt for payment for publishing advertising, announcements, and more for the Union cause. Maybe I can claim I got part of my interest in editing and publishing from him? I now have a mystery about Franklin, though. My previous research had indicated his middle name was Peter. According to the transcribed articles on the Warren County Civil War blog, however, he called himself Franklin Pierce Sellers in his newspaper. Jay Richards, the author of the blog, suggested that Franklin might have renamed himself to sound more "presidential." I will, of course, be adding the middle name question to my (long) list of research items . . . .